In those in-between days when I am not in Italy, I do all kinds of things to maintain my dolce vita lifestyle... drink vino, read about Italia, eat fabulous pasta with homemade sauce... and I garden. My husband and I have worked for years transforming what was once an empty backyard into an urban paradise. And our goal has always been to make it feel as Italian as possible down to our choice of plants. To my great delight, one of the plants I see most often in Rome also grows well here in California: Cyclamen. With heart-shaped leaves and charming pink, white, or red blooms, Cyclamen come in twenty different species and are native to parts of the Mediterranean including Turkey, Greece, Lebanon, Libya, and Italy. They are annuals that like part-sun and live for many years even in containers. 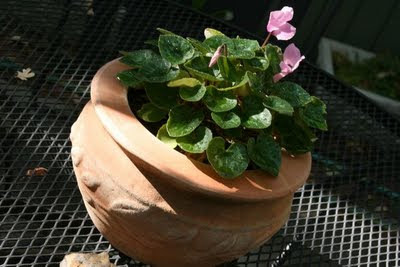 In Italy, you often find Cyclamen in pots, flower boxes, and planted around trees. They are beautiful in the summer, but they are particularly spectacular in winter when they bloom prolifically for months. 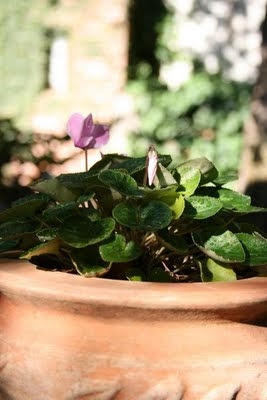 It isn't unusual to see cyclamen blooming outside in January in Rome -- and even in Florence during milder winters. Here in California, my little plants pant all summer long waiting for the cooler days of autumn when they burst out into a riot of color. They bloom clear into spring and are often the only spot of color in my winter yard. I also grew Cyclamen in Minnesota where they bloomed all summer and sometimes through the winter when I brought them inside and kept them in a sunny window. I was just at my local garden shop today, and the shelves were full of Cyclamen in several shades. I'd imagine I'll be planting a few more this weekend, too. 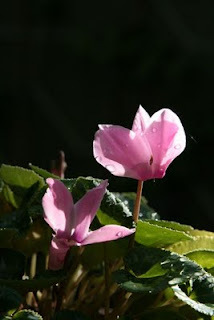 For more information about Cyclamen, check out the Cyclamen Society. Thanks to Delicious Baby for hosting Photo Friday. For more great photos, visit DeliciousBaby.com. From one flower-lover to another: brava! And thanks for sharing the photos of your flowers. I love cyclamen, too but haven't really lived in spots where they would thrive (I always admire them in my mother-in-law's San Fran garden). Wondering now if I can grow them with success in Sicily? These are about one of the only flowers I can grow. Love the range in colours as well. Actually I think it was one of the first flowers I was given as a child by my mother. She used to grow miniature ones in the garden. echoing wandermom - brava! i love cyclamen. your photos are so beautiful, too. Lovely flowers. Unfortunately, I kill everything I try to grow, so it's nice to see someone can do it! I love your priorities! Good reminder to adjust mine - I have a great patio waiting to be enjoyed...right now! This just reminds me of the wild cyclamen in Greece, that peep out from under all the olive trees at this time of year. Along with the smell of woodsmoke from the burning piles of olive punings, that signifies the coming of autumn in Greece. Yup, I have pretty much a "brown thumb", too...but I can vicariously enjoy everyone else's gardens! Thanks. Thanks for all of your comments! For those of you with a "brown thumb": the beauty of Cyclamen is that they are really, really easy going. Truly. A plant that will thrive in the heat of Sacramento as well as the fog of San Francisco... it is a rare and wonderful thing.